Another of my old slides I had converted to digital. This shot was taken in April of 88'. 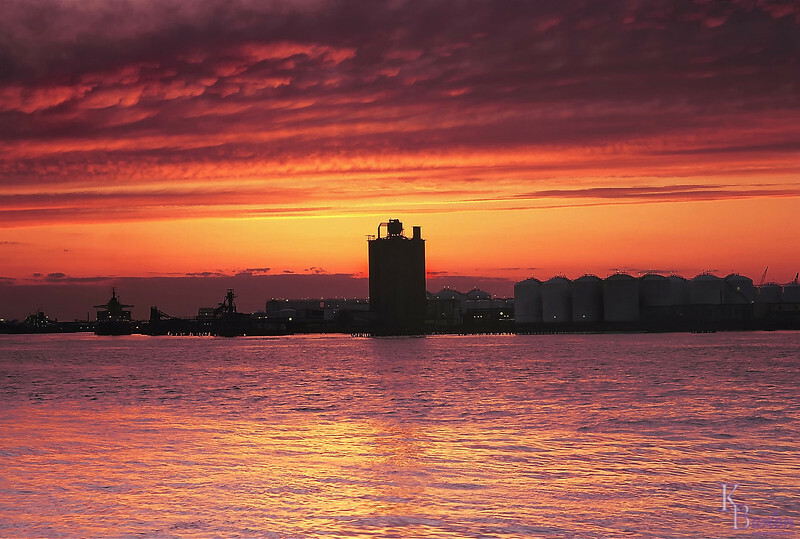 I had been living on Staten Island for 8 or 10 months by then, and I had been captivated by many of the sunrise and sunset shot possibilities I would see as I walked to and from the ferry terminal each day. Though this potential scene I first saw it while riding on the bus. Now with most scenes I have time to frame up with my fingers in front of my face like some movie director, but this one whizzed by the bus window so fast I knew I'd have to bring a few different lenses with me the first time, as I wasn't sure where exactly to stand to get the shots I imagined I'd like to capture. On this trip I wasn't even trying to get this shot, as when I left the house this morning I was hoping for a near cloudless sky and a rich blue and red sunset, which I was going to capture with my 28mm wide angle and aimed a bit farther to the west so the plant would start the shot on the right side of the photo and the Bayonne bridge would end the shot on the left. With that composition the sun disappearing below the horizon would create a beautiful curve of light in the sky that would frame those two corner objects perfectly. But that angle made little sense with this cloud cover, however instead of leaving I set up my tripod on the docks and waited to see what the coming sunset would do to this sky. When the purples started to develop in the clouds I excitedly switched to my 55mm lens and pulled back out my graduated neutral density filters and looked on in wonder at the beautiful scene unfolding before me as I fired off my camera. Now today this shot isn't even possible any more as the plant that owns the dock I stood on to get it, put up a fence around their grounds to keep the public out, and even more so, they also tore up the dock, so there's no place to stand to get this angle and include this much water in the foreground in the same shot. As I've said many times before, every shot is a unique collection of numerous things both seen and unseen that will never be exactly reproduced the same way ever again - enjoy them when you see them as they may turn out to be a priceless memory. Beautiful scene, such glorious skies & reflections! Excellent conversion! Beautiful conversion of a lovely shot! Hi Kevin... what a great photo to convert over to digital! Long may it live :-).